Natuzzi Editions Tullio Cinema sofa has arrived first at the U.K.’s largest Natuzzi Editions Gallery at Furnimax Accrington Lancashire. 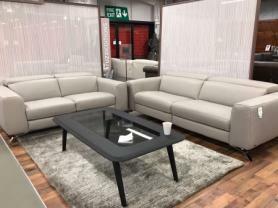 With super sleek slim and stylish arms this model is definitely part of a new design ethos and certainly the shape of things to come in sofas. When configured as pictured the cinema sofa offers a very stylish approach with maximum seating for minimum space requirements, giving a stylish solution to smaller contemporary home or cinema theatre room applications. Offering maximum comfort with a high back design, features manually adjustable headrests with power recliner leg rests. The wedge tables are very handy with storage and drink facilities. The lights are touch sensitive which add to the beauty of the sofa. This sofa is modular hence can rearranged according to your room.